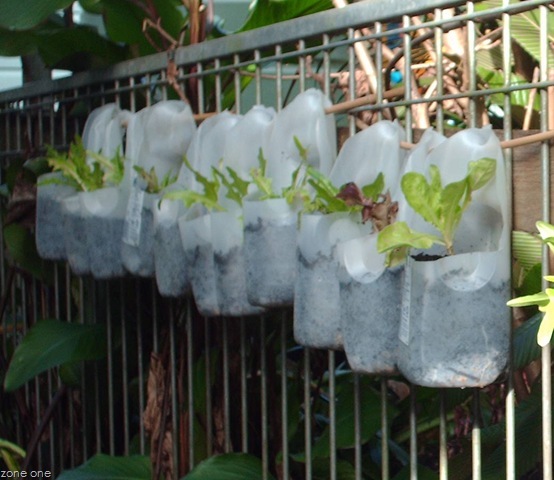 Milk bottle madness cut tops, leaving handle & pierce holes in base for drainage , fill with good quality potting mix. 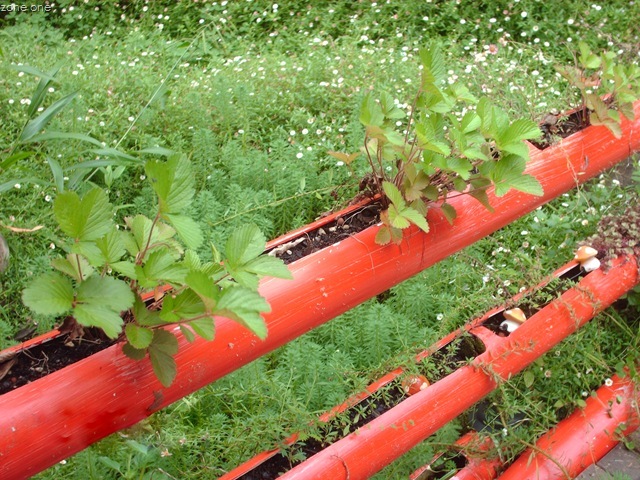 right: bamboo ladder with lettuces at bottom & snow peas above with supporting stakes . Note angle & alignment of bottle handles providing protection from sun. 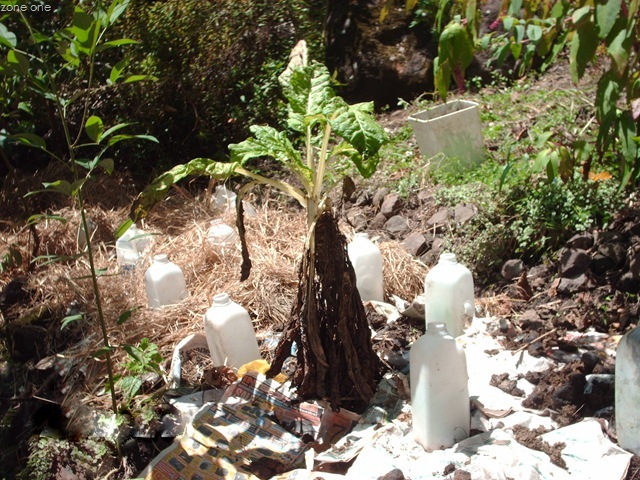 Temporary containers made to decompose Plant seedlings into cardboard containers, (toilet rolls, wax milk cartons,etc) & plant directly into ground when ready (less transplant shock). 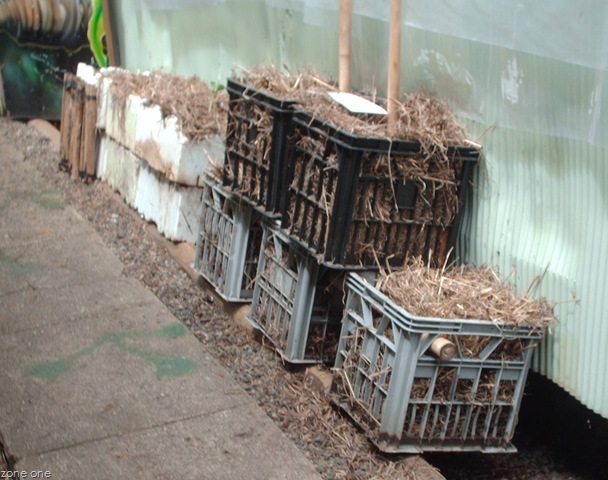 We like hessian potato sacks filled with soil & straw mulch for growing potatoes. By the time the spuds are ready, the sack has decomposed & you can leave it where it is to build up soil. Placing the sack directly on the ground kills any weeds or grass lawn (useless stuff) so after the crop is harvested, you have clean bare ground to replant. 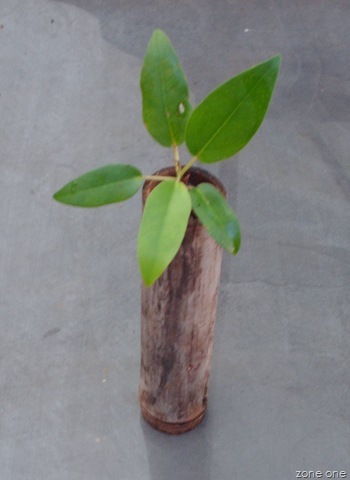 This little strangler fig is growing in a piece of bamboo- which make nice vases or pots for bonsai. We’re hoping this tree will grow up to become a living bridge one day, to which end, it will be transferred into longer & longer lengths of bamboo as it grows. Living bridges take generations to grow, best start now! Raised garden beds take of lot of backache out of gardening, & commercial versions are available, but of course, anything can be used for the walls. 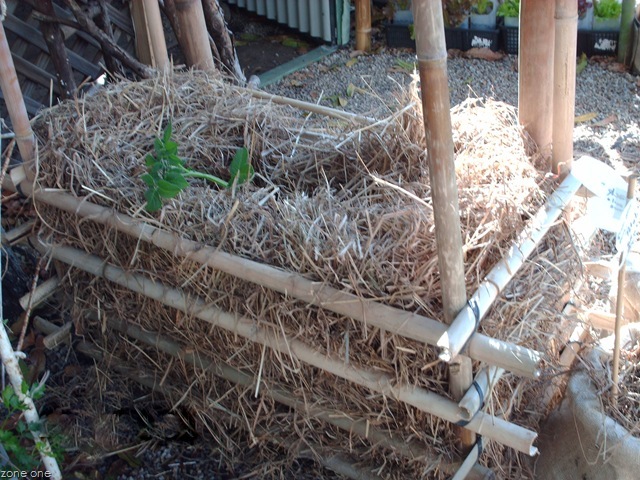 I like to build soil where it will be used, so start your raised garden as a compost bed, layering sticks & pruning’s at the bottom for drainage, pile up green weeds (biomass, biomass yah!) & kitchen waste, cover with newspaper to stop weeds re-sprouting, add layers of whatever organic matter you can get, leaf litter or straw mulch, manure, worm castings, seaweed etc. 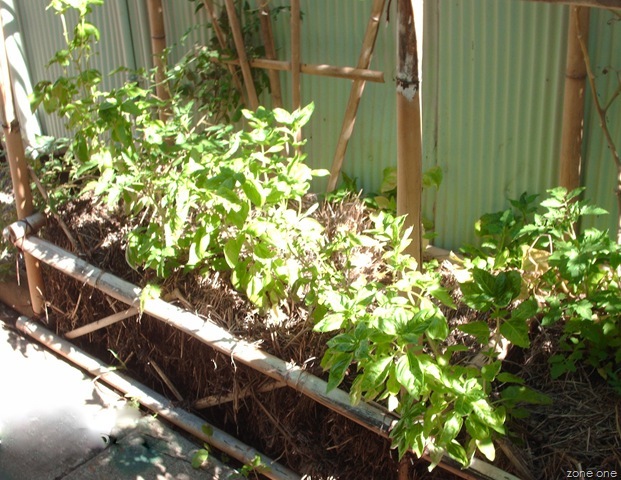 Allow to cook for several months & plant. Yum! Above: I call it a food basket! 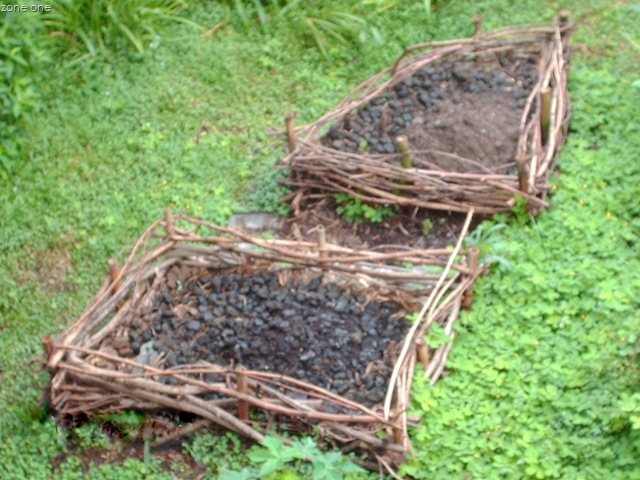 These beds (m2) have been made by weaving mulberry branch pruning’s (flexible) through bamboo stakes. Looks so cute! Aquatic gardens Water is an important part of a natural garden & a beneficial addition to any space, no matter how small. 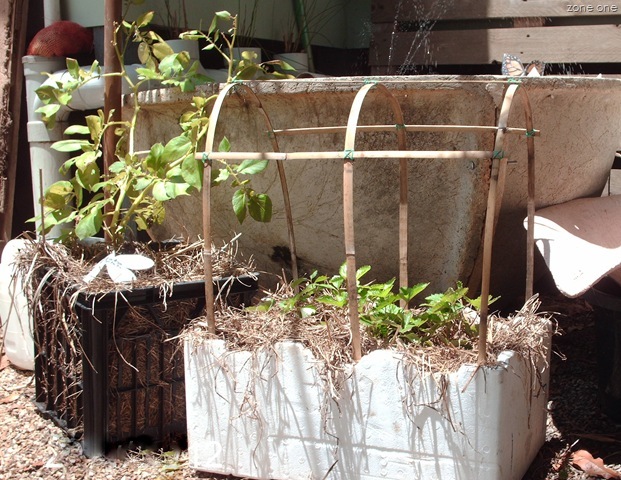 Make use of your water feature to extend your growing range, add edible aquatics like watercress, water chestnuts & kang kong (Chinese water spinach). 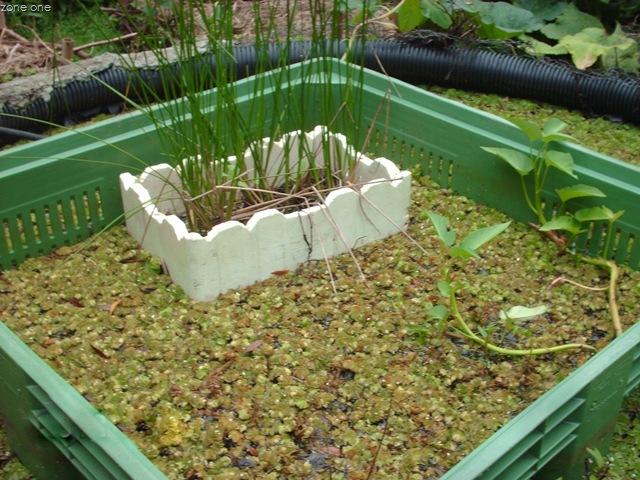 Many plants that have high water requirements can be grown in containers floating on the surface. (left)Aquaponics (combining fish & vegetables) is becoming popular & hydroponic systems are now the preferred growing method for many commercial lettuce & strawberry farms. I prefer my food plants to grow in more complex natural soil, but the fill & drain method of hydroponics can be adapted for well drained growing mediums. 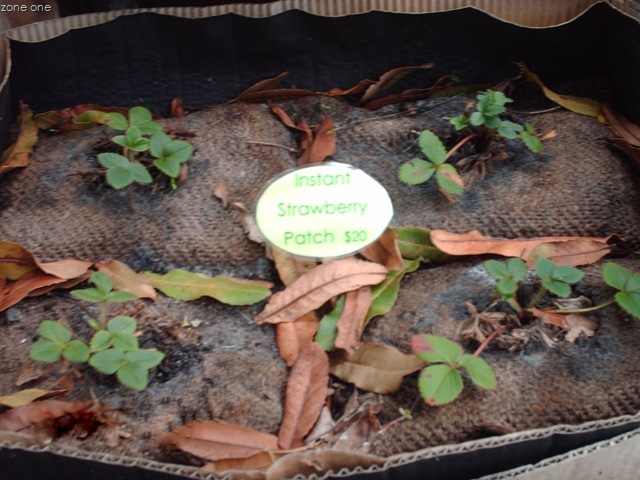 Try a mix of biochar, gravel, sand, broken terracotta, perlite, vermiculite (expanded clays), & compost. Add weed tea & seaweed solution regularly to replace nutrients that may be leached out by constant flushing. Better still re-use the water by pump or bucket collect. 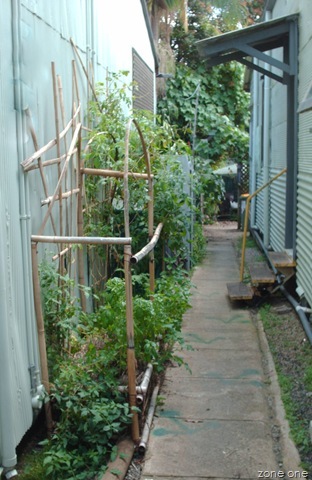 The strawberry pipe garden (above right) is a vertical reticulated system (solar pump) that doubles as a fence/ balcony railing. 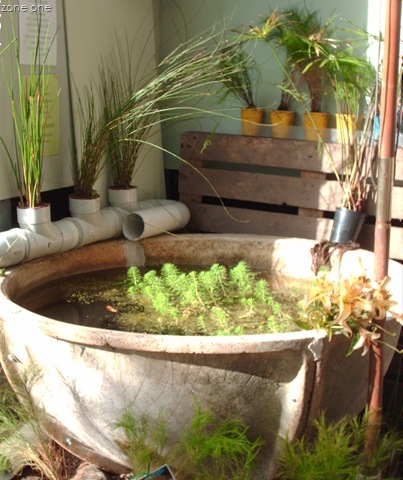 Because aquatic plants take nutrients from the water. 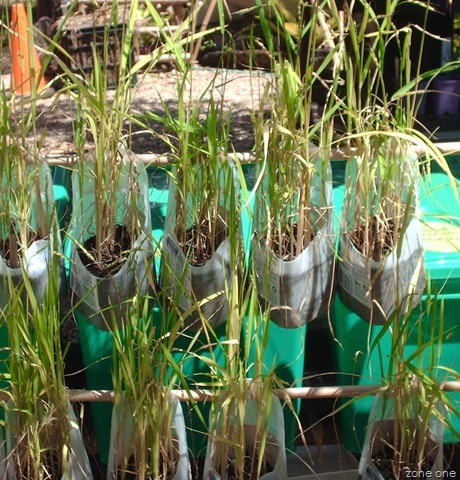 they can be used in water purification systems (reed beds) Many also convert toxic compounds into less harmful elements & can be used to take up heavy metals. The pipe garden at left receives water from a hand wash basin above it. 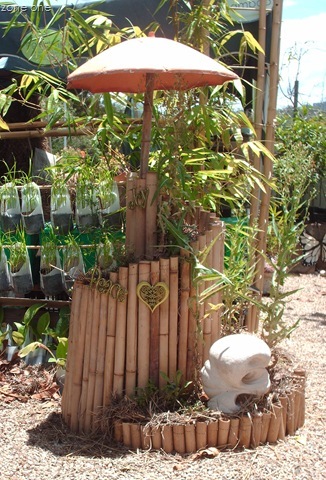 It collects in a vertical pipe filled with charcoal, before filtering through the horizontal pipe filled with gravel & planted to weeds before entering the fish pond (local Rainbow fish & silver perch- who take care of mosquito larvae, no feeding required!) Of course, only non-toxic liquid castille soap is used & bio-active cleaners in the bathroom. Don’t put down the sink what you can’t drink! If it makes the fish sick, it’s probably not good for you either. 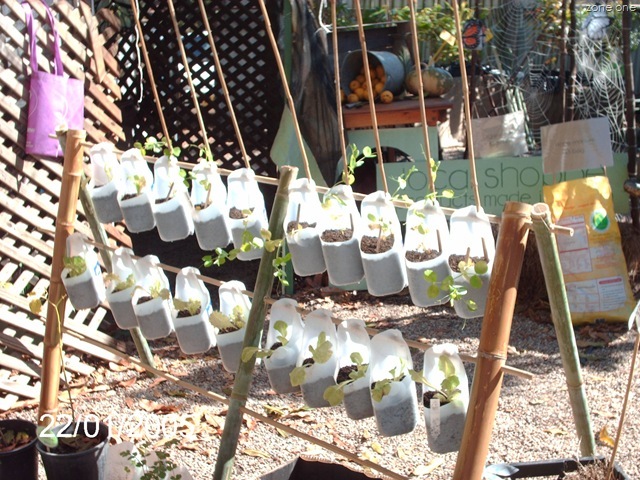 This entry was posted in grow food, soil, water by zoneonesustainableliving. Bookmark the permalink.